After a wait of more than 25 years, I'm very pleased to announce the arrival of the first Parafernalia Revolution fountain pen! I firmly believe that this innovative beauty is destined to find its rightful place at the Museum of Modern Art in New York -- just like its ballpoint progenitor. 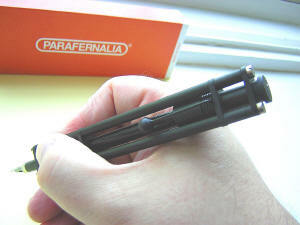 Although it's the same length when 'capped' as the ballpoint version -- about 5-1/4" long -- and 5-3/4" 'posted', it has a noticeably greater girth than its ballpoint brethren. 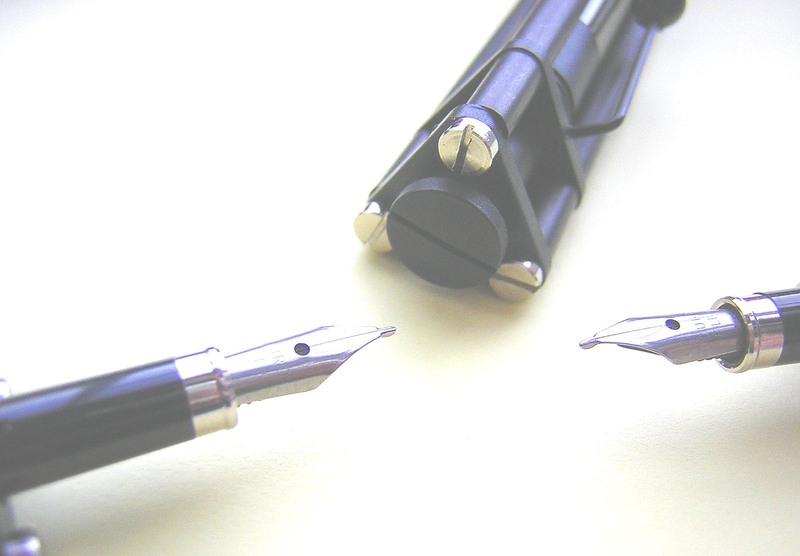 While the widest point of the ballpoint is 7/16", the fountain pen measured 11/16" wide. That may not sound like much, but it provides a very different feel to the two pens, and allows for a very stable base for writing with liquid ink. 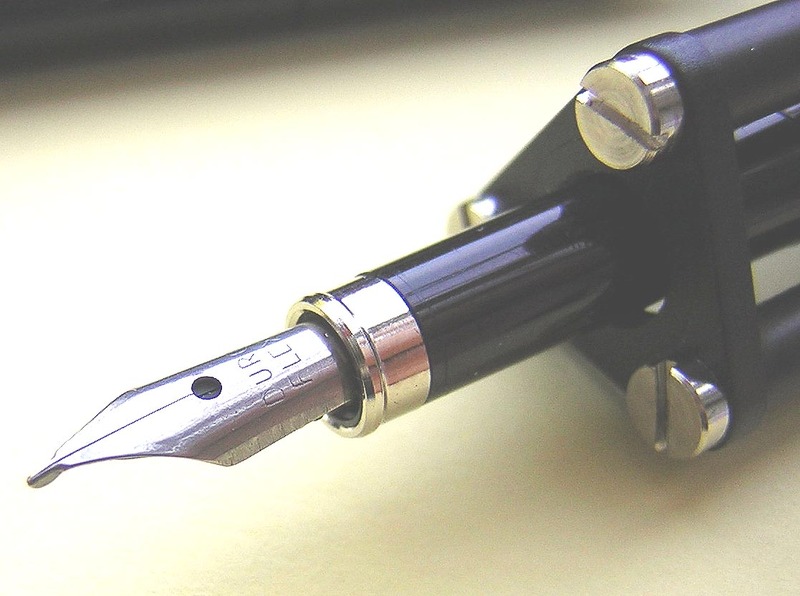 I used the terms 'capped' and 'posted' in the paragraph above advisedly, as the way this unique fountain pen works is that the nib and ink reservoir are removed from the pen as a whole, turned 180 degrees, and re-inserted into the body of the pen for writing! The accompanying photo shows -- from top to bottom -- 1) the Parafernalia outer box; 2) the included leather pen pouch; 3) a Revolution in the 'capped' or closed position; 4) the nib/ink reservoir removed from the pen body; and 5) the Revolution fountain pen re-inserted and ready to write. Somewhat surprisingly, the triangular shape of the pen makes for a very comfortable feel in the hand, and with the ability to rotate the nib/ink reservoir to any desired position relative to the pen frame, I can't image ever getting fatigued writing with this wonder. I don't have an exact count yet, but the ballpoint is entirely hand-made with 31 miniaturized metallic components, and I'd say we're in the same ballpark here with the fountain pen. It uses special thin ink cartridges only (which are included), and the steel nib is rated as a medium. 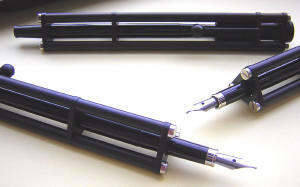 The nib is marked 'Duro Flex', and we're still awaiting word from Italy as to what that means to them! 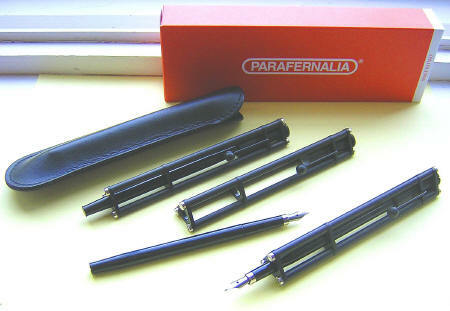 The pen comes with a leather pen pouch (although the clip is perfectly serviceable for a shirt pocket), four thin black ink cartridges and a 3-year replacement guarantee against defects in materials or workmanship. 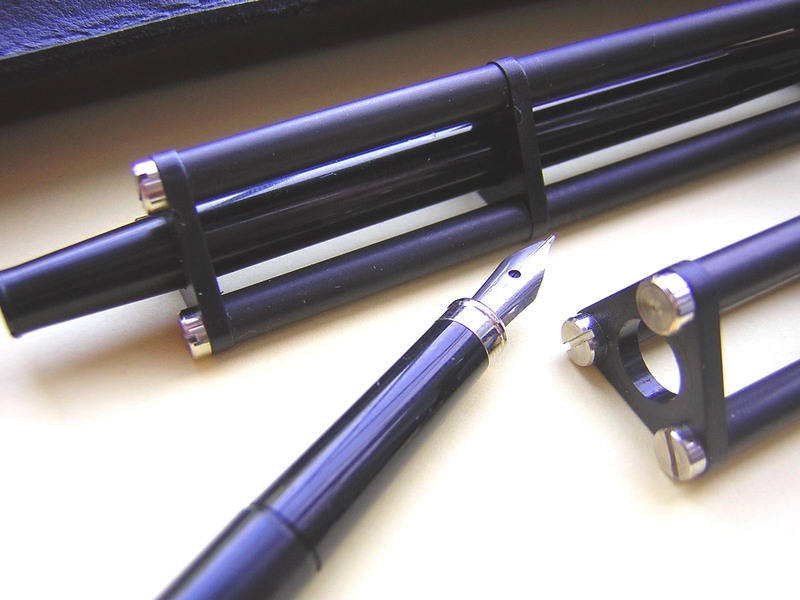 To say that this pen will make a unique addition to your fountain pen collection is a bit of an understatement!